This is my last bike, and the most recent addition to the stable. 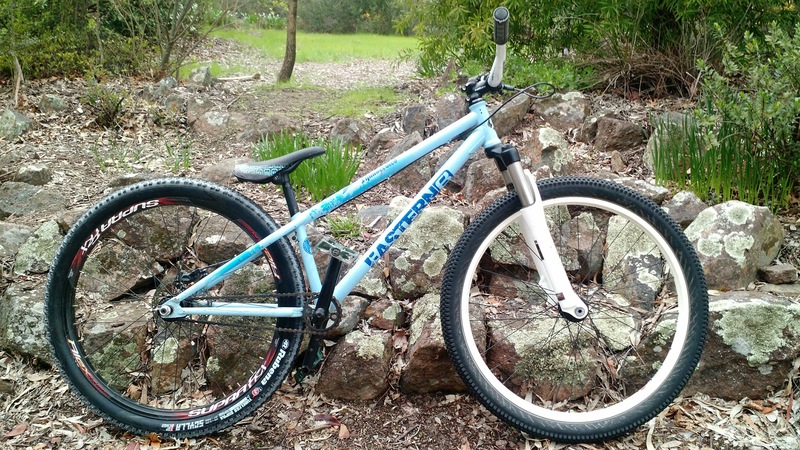 It’s a roughly 2013 Eastern Thunderbird, made for doing massive whips on massive dirt jumps. It’s a chromoly frame, and those forks have 36mm diameter chromoly stanchions. The front axle is 20mm, with a 14mm bolt at the rear. Ohyeah, chromoly 3-piece cranks with a spanish BB complete the picture. The front wheel is the original, the rear is a novatec DJ hub on an Alex Supra-FX rim I stuck on it. Unbreakable! It has one brake. It’s the cyclist equivalent of ‘do you even lift, bro?’, and pretty much gets cobbled together out of spare bits when something goes wrong. It’s main reason for being was to ride with Joe an Oli, who had also bikes with one gear and terrible brakes – so whenever we go someplace to ride we are on a pretty even footing. They’ve also grown to like riding and scootering at the skatepark, so I obviously needed a new bike to suit! …and what does it do for me? It’s my proper training bike. It doesn’t teach me how to get Strava KOMs out on the Uriarra road, it teaches me how to get better at manuals, bunny hops, riding transitions, pumping, and landing sideways. It also makes my shoulders and biceps bigger – no need for a gym with this beast – and sometimes teaches me that my ideas are not yet matched by my skills. This translates, of course, to riding other bikes. I’m a better mountain biker because I learn to handle a bike properly, I’m a better cyclocross/gravel monster because my core and upper body is stronger, and I’m a way cooler dad because I can get involved with my kids, help them learn the ways of the skatepark, and I also have to get off and walk wirth them when the hills are steep. …and I occasionally manage to bust out an impressive move. Winning all around. Would I recommend you buy one? *Caveat and disclaimer – ride responsibly! These things can also be quite dangerous when concrete gets involved.